Byzantine. Justin II. AD 565 to 578. Size: 21.3 x 21.7 mm. Weight: 4.46 grams. Grade: gVF, but with a few scratches in the upper right of the reverse. On a very broad flan, very well centered. Obverse: Helmeted facing bust of Justin II, holding a globe on which stands a small figure of Victory, with h DN IVSTINVS P P AVI around. Reverse: Constantinopolis seated forward with head right, holding a spear and globus crusiger, with VICTORIA AVGGG B round, with CONOB below. Byzantine. Maurice Tiberius. AD 582 - 602. Date: year-4, AD 585 to 586. The date is written iiii but the leading I is much smaller than the others, and appears like it might have been added later to convert a year 3 die into a year 4 die. Normally a year 4 would be written with the four I's in two lines, rather than one. Size: 16.7 x 17.7 mm. Weight: 2.28 grams. Grade: VF with a very dark brown patination. Very well struck and significantly nicer in the hand than the image suggests. Obverse: Facing bust of Maurice Tiberius with a corrupted inscription that reads something like D P I C P I AV around. AD 813 to 820. AE follis. Size: 16.9 x 19.1 mm. Weight: 2.45 grams. Grade: aVF, dark green patination (almost black in some light). Obverse: Upper body of Leo V facing, wearing a crown and loros, and holding a cross, with L to the right. Reverse: Constantine wearing a crown and Chlamys, holding a globus crusier, with KONST around, but starting at 10 o'clock, and ending at 9 o'clock (once you know where to look, you can read the entire inscription). Byzantine. Justinian I, AD 527 to 565. 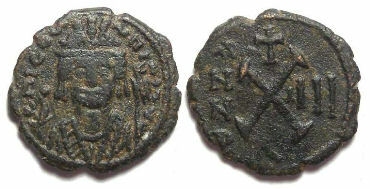 Period: Byzantine, time of Justinian I, AD 527 to 565. Size: 19.2 mm across the rounded part of the seal, not including the projecting points. 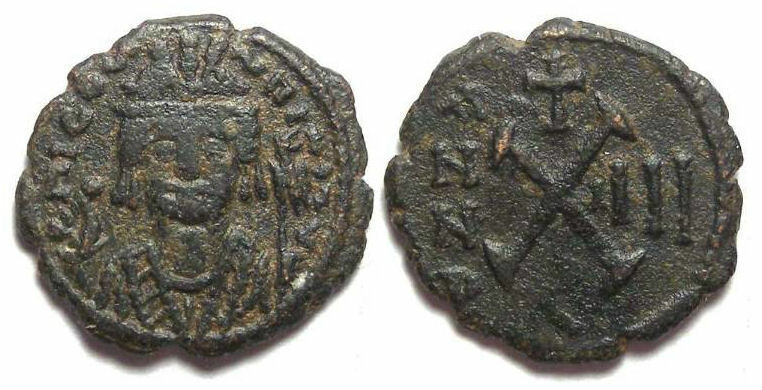 Obverse: The obverse shows a nimbate facing portrait of Justinian, with an inscription naming him (only part of the inscription is visible). 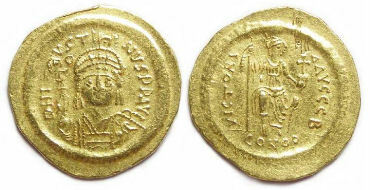 The basic style is similar to that seen on many of his coin, although he is only shown nimbate on some of his gold medallions, and on many of this early coins during his joint reign with Justin I. Reverse: Victory standing forward with head right, holding a wreath in each hand. This design is very similar to that seen on gold tremessis coins issued from about a century and half prior to Justinian, right up his time. 1) The hole through which the cord this seal fits over is 10 mm wide, which is very unusual for Byzantine seals of this period (it is usually just a small round hole no more than 1 or 2 mm wide. This suggest the seal was meant to go over a wide cord or ribbon of some type, something more substantial than a simple document tie. 2) This is a royal seal, with both the image and name of the Emperor. 3) The reverse is very similar to a type of coin that must have circulated fairly commonly in that period. 4) In spite of being a Royal seal, this is a relatively common type as early medieval seals go. No one knows the how these seals were actually used, I have speculated a one possible use for this type was to officially seal bags of bronzes coins, with a total value of 1 tremissis contained in a bag. The theory that earlier bronze coins were circulated in that manor, is a fairly widely held, but as yet un-proven. But is would explain why this type is relatively common, and why the design is very similar to a gold tremissis. PLEASE NOTE THAT THE WHITE COATINGS ON EARLY LEAD SEALS ARE LEAD OXIDE, WHICH IS VERY TOXIC IF INGESTED. THESE SEALS MUST BE HANDLED WITH CARE, AND ONE SHOULD NEVER LET CHILDREN HANDLE THEM (THIS IS TRUE FOR ANY ANCIENT OR MEDIEVAL LEAD OBJECT). We have made every effort to describe each coin as clearly as possible, with inscriptions provided as we have read them from the coins. Unfortunately, the medieval letter forms, and often less-than-perfect strikes, can make the coins difficult to read and we may occasionally get a letter or two wrong. Please feel free to contact us if you notice any such mistakes. In reality, there was no such thing as a Byzantine Empire. This is a 17th-century term for an empire that considered itself the eastern Roman Empire right up to its fall in AD 1454. Modern historians normally refer to it as the Byzantine Empire but there is confusion as to where the boundary between the Byzantine and Roman Empires should be placed. For numismatic purposes the best-fit boundary seems to be Anastasius' bronze coinage reform in about AD 496. Collectors of Roman coins consider Anastasius to be the last Roman Emperor, while collectors of Byzantine coins think of him the first Byzantine Emperor. He certainly thought of himself as the Emperor of Rome, as did each Byzantine emperor for almost the next thousand years.